Jane then went to Yale University as a zoologist where she worked on the vitamin content of army rations. In 1943, she married John D. Anderson, and took a position at a government rubber research lab at Salinas, California, while he was deployed to the war. Her next position was with Children's Fund of Michigan, a research lab of Women's Hospital in Detroit, where she analyzed the vitamins in mother's milk. The Andersons reunited after the war at Stanford University, where Jane joined a research team in the chemistry department to work on developing a vaccine against polio. In 1947, the Stanford team announced a dramatic breakthrough: a crude vaccine which appeared to confer immunity to the Lansing strain of the polio virus among cotton rats. This experiment was an important precursor to the development of the Salk and Sabin polio vaccines. After John earned a PhD at Stanford, the couple moved to Champaign, Illinois, for his position at the University of Illinois. Jane raised four children, did volunteer work, painted, and tried other mediums of art, including totem-pole carving. She even excelled in history, one of her least favorite subjects at Reed, and wrote the history of Channing-Murray Chapel at the University of Illinois. Other members of her family who attended Reed include her mother, Ruth Graybill Collier ’32, MA ’38; her sister Miriam Collier Hope ’39 and brother Robert P. Collier ’42; and her niece, Catherine Collier ’68. 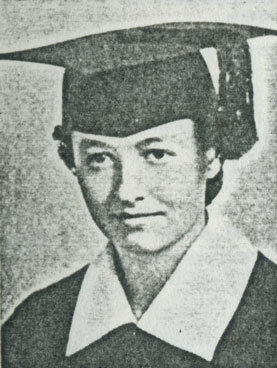 Jane's contribution to medical research was noted in the feature "Pathogenius" in Reed magazine.